I love all the new colours we have for Christmas today, shocking pinks, purples and even black, but I think I am a traditional girl at heart. I remember the smell of Christmases past, the pine tree, the cranberries, the colours were more muted, traditional even - reds and greens. I hunted the world over for a rustic Christmas range, and I really do mean the world. I tried every manufacturer and even wholesalers that I could think of. Nope no rustic range to be found. So I designed my own and New England Christmas was born. Our New England Christmas Collection is rustic with a olde twist. 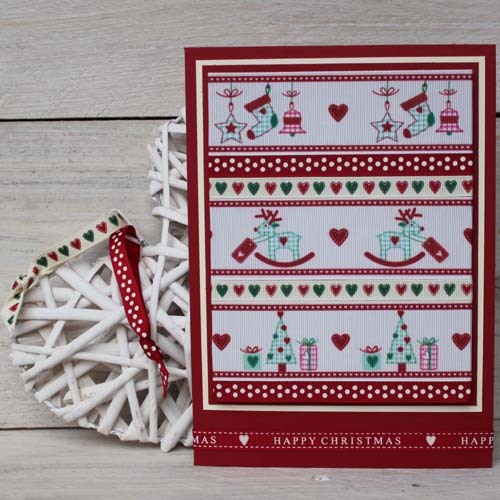 Happy Christmas saddle stich ribbon with little stitched hearts compliment our vintage rocking reindeer, wrapped parcels, hanging decorations and Christmas tree ribbons. The collection is in delightful shades of cranberry and antique white with a hint of forest, a winning combination of Christmases past. There is so much detail in this collection, the little hearts have tiny stitches, as if they have been hand stitched to the ribbon. all the ribbons are grosgrain which adds a vintage feel to the collection. Once again we have choosen the words Happy Christmas and teamed it up with the classic stitched effect ribbon. The rocking reindeer is my favourite, he is just so sweet. Every little girl must have dreamt of a rocking horse for Christmas at some point, I know I did. Even now I want one! All the ribbons work so well together, they were designed as a Collection, not just ribbons brought together. Sadly I did not have all the ribbons to photograph so you will see images saying photos to come. This is something I have never done before. I had hoped they would be with me today, but the tracking details tell me they have stopped off in Paris!! We have tried to think of all the ribbons you would need for your projects, we have had 3mm grosgrain dyed to the exact same colours of Cranberry, Forest and Antique white so that you can use them for tag ribbons. We have also included 63mm grosgrain in Cranberry and Forest so that you can wrap around your cakes, maybe adding the Christmas tree ribbon on top.